The West Island. What can I say other than it’s far? It’s where my Saturday yoga class takes place and I have friends who live there. Living in the east end, I always like to complain about the West Island. I find it fun to bug West Islanders about how far they live, but I after all the jokes are said I do recognize that there are some good spots to eat there and I do try to check out a couple breakfast places whenever I’m on the west side. On this week I went to get together with my friend and she was in charge of suggesting a place in the west island I had not been to. Her choice was a place that I had never even heard of called Maurizio Café. People in the area would know Maurizio’s as more of lunch/dinner place as well as a spot where you can duck in for a coffee. The breakfast, I was told, has only been offered in the last while, although it is available every day of the week, which is nice to know. When you walk up to Maurizio’s you are greeted by a nice terrace with umbrellas on the tables and on the inside there is ample seating with lots of tables and chairs. The place is wheelchair accessible with the wheelchair washroom being the men’s room, which coincidentally has a washing machine in it for some very odd reason (I guess they’re cramped for space). The menu is a few short pages and covers most of the classics. Most items are in the $8-$10 range. You will find all the morning staples here and for a decent price. Omelettes are well represented with around 15 choices. You will find around ten crepes and pancakes and French toast options are not as plentiful but you still get 3 options. The egg section merges classic eggs and eggs Benedict all decently priced with one plate in the $12 zone. There are also other items to eat which can be found on the chalkboard as well as some childrens menu options. We started off with a classic 2 eggs dish and toast ($6.95). The eggs were poached and the consistency was very good with a good assortment of fruit They were cut generously which is always nice to see although more varied fruit would have been preferred and there was this nice mini muffin like treat that was a unique treat, tasty and a welcome addition to the dish. I do still think it could have been filled with some more stuff since there was a little more white space from the plate that I would have liked. 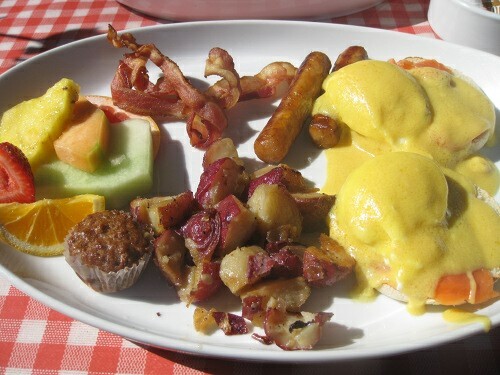 I had the Frabbatino Salmon ($12.25) which is two eggs Benedict on an English muffin with smoked salmon (I love my smoked salmon) and a side of sausage bacon, potatoes, fruit and that little muffin thing. The eggs were properly done and the Hollandaise sauce was good. The potatoes were a nice touch since they were not baked and had their skin on them; the fruit was fresh and that little muffin thing was welcomed to show up on a second dish. Although the taste on each of these dishes was not out of this world it was good and fresh, and for the price it’s a pretty good deal. Our waitress was really nice and pleasant, she was prompt with the menu, and food as well as coffee refills. I also think she threw in some free stuff on my friends plate since the bill did not show any extras and my friend changed up her order from what the menu offered so that was very much appreciated.. Some of the dishes are vegetarian friendly although you will expect to find some options with ham, bacon or sausage but you have almost a 50% chance of getting a vegetarian dish. It is a touch meatier than most other places I have been to recently but you still have choice. What I find is missing is a few health menu items. As for vegan you are out of luck since cheese and eggs are in most dishes that don’t have meat. I was quite pleased with Maurizio’s as I felt the prices were quite decent, the portions fair and the food was tasty. I would come back again and try the waffles since they looked really nice and I regret not ordering them. The parking situation is very good, and it is right by the highway. 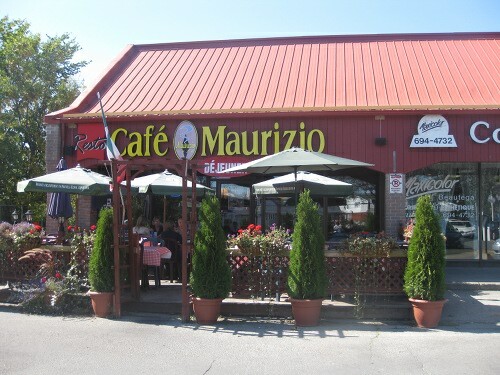 Also, if you live in the West Island and are tired of going to the same 4 places then check out Maurizio Café and you will likely find yourself coming back again..
Just a heads up that Cafe Maurizio’s actually closed and has been replaced by another resto!